Protest against pre-Yom Kippur kaparot ritual turns ugly as protesters goad Jews with anti-Semitic slogans. 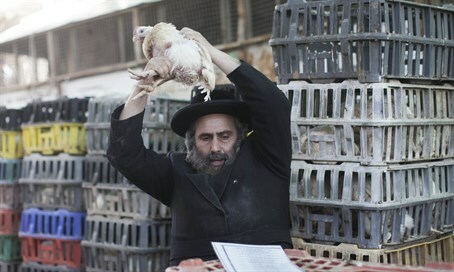 Animal rights activists around the world once again mounted their yearly campaign against the controversial kaparot ritual, practiced by some Jews on the eve of Yom Kippur. The custom involves circling a chicken above one's head (not spinning or whirling it, as some falsely portray it) while asking God to transfer the person's sin to the animal, before it is slaughtered and given to the poor. It is however highly controversial, with many adherents opting to use money (which is then given to charity) instead of a live chicken, and a wide range of Jewish commentators and legal authorities coming out strongly against the custom, which is believed to have originated in the last few centuries in Europe. Animal rights activists site this as proof their campaign is not meant to target Jews, but merely to protect the welfare of the animals. However, many Jews have claimed the opposition has often been motivated by anti-Semitism, with anti-Semitic epithets and other abuse hurled during confrontations with far-left protesters. One such instance was caught on camera outside Congregation Ohel Moshe in Los Angeles earlier this week. During the confrontation animal rights protesters can be seen goading Jewish worshipers, with one man shouting "money, money, money, money!" and a woman activist mocking holocaust victims, telling an irate Jewish man she didn't care about "you and you f***ing ancestors!" Other worshipers at the synagogue - which largely caters to the Iranian-Jewish community in the area - can also be seen clashing with a small handful of protesters.